Easily divide your landscaping while supporting your climbing plants with this New England Camden Privacy Screen. 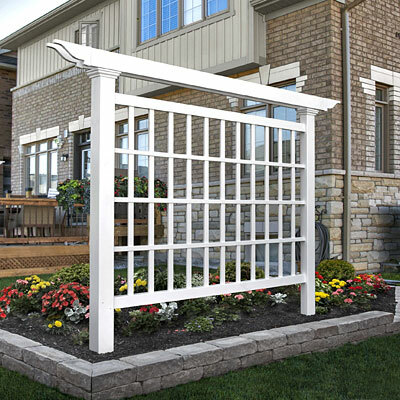 This bold item can serve as a trellis, plant support, or screen, for a truly versatile and beautiful garden addition. The 80" width of the screen easily spans a wall or garden row, and its significant grid pattern creates a wealth of gripping spots for tendrils. Two top beams lend extra length to the piece, thanks to their ornate, overhanging endcaps, and trimwork on the uprights furthers the decorative hint. A wealth of 1.5" square rails creates the interior grid, and the white color and vinyl construction will not burn the tendrils. This also allows you to clean the unit by rinsing it with a hose periodically, and the screen will never warp, yellow, or rot for years of enjoyment. Insert a wooden 4 x 4 post (not included) into each hollow upright for a stable installation in your garden or yard. Create a defined space in your landscaping using this Camden Privacy Screen. Assembly required. Twenty year warranty.